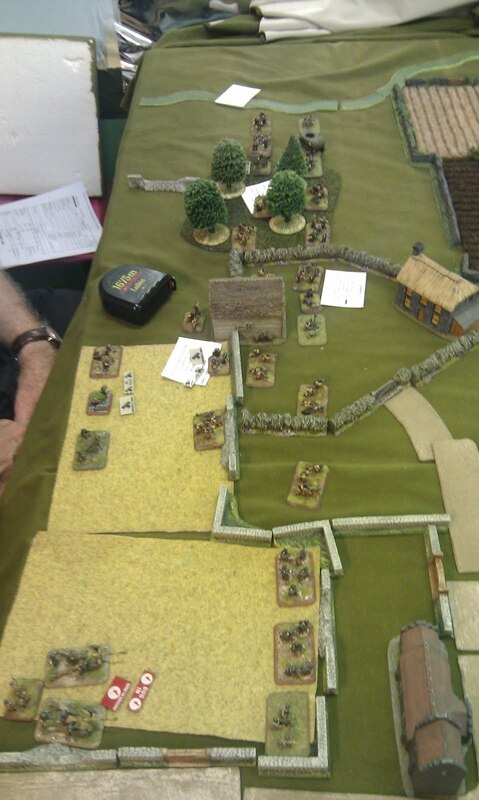 I ran a couple of small (8-900 points) Flames of War games for David and Dan, two of our newer members. The first game was American Armour against German Panzers. David took the Germans and Dan the Americans. David won the roll off for table side and chose the side with the village, so stayed in good positions while the Americans tried to close to make their firing effective. 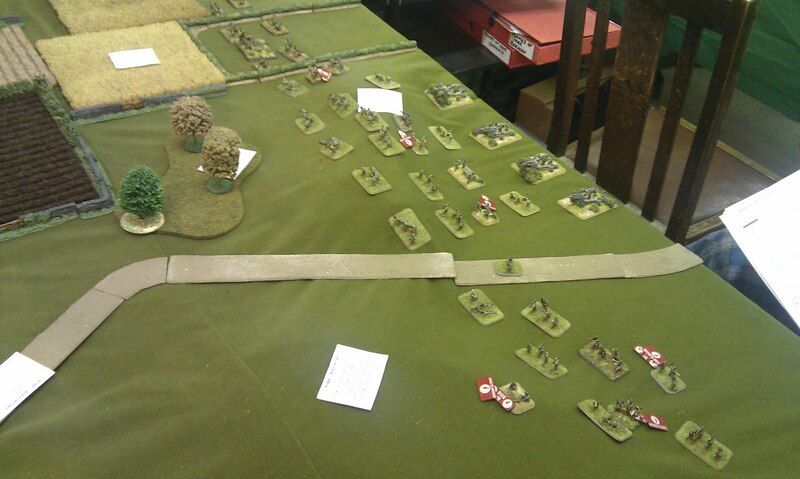 Once the Americans on one flank had broken, the Germans began to advance and rolled up the surviving Yanks. Having got the basics of moving, shooting and morale nailed down with just a few units we played a second game, this time with two infantry forces, adding artillery to the mix and objectives rather than just killing each other. Both players kept the same nation and the same table edge, but this time both had to move. On the US right the Yanks advanced on the village and got pinned down short engaging in a viscous firefight. On the other flank both sides advanced and the US artillery proved spectacularly effective, blowing great holes in the German lines. These were expanded by the following up infantry and once the Germans broke the Americans stormed forward to victory. This was a fun couple of games that just proves that you don't have to use big armies and hopefully has got two new members more involved and keen to try some more games. I'm am now over 30, been a wargamer for over half that. I play anything and everything at least once. Some say I have eclectic interests, others that I have a short attention span!